So, I visited my parents in Maryland for the first time in nearly two years. The reason for the big lapse in visits is a story for another post. 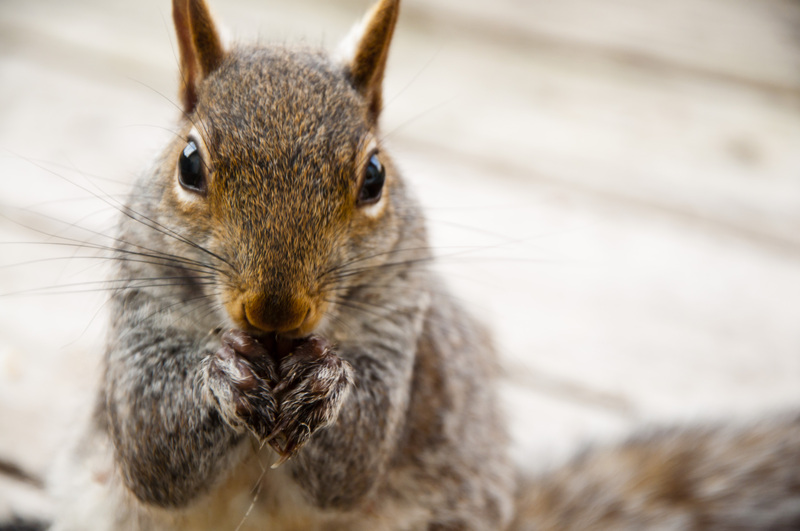 This post is about my father’s relationship with squirrels. My mom, dad, and I were sitting in the family room, and in the few brief moments that Gus allowed me to do something other than pay attention to him, I noticed their new bird feeder. Truth be told, it may not be all that new, but it wasn’t there the last time I was, so I’m calling it new. It looks a bit like a two stage rocket for a manned space flight from a communist block country in the late sixties. This retro-space-age bird feeder is not only a monument to interplanetary travel, it’s also squirrel proof. My dad made it himself. The feeder itself (which will serve as the capsule when it’s actually repurposed for a lunar mission) is made from eighth inch thick aluminum bent to approximate the profile of a barn with ends made from very thick plexiglass cut to the same profile so that the aluminum can be screwed to them. It’s supported by the stage one rocket, which is actually a section of four inch diameter PVC pipe. I asked him if he’d reinforced it with something to keep it from bending; fully expecting him to tell me that he had filled it with concrete. The truth is even stranger and more labor intensive. He’d purchased a two handled draw knife from a local antique shop and used it to round off the corners of a piece of four by four lumber that is three feet longer than the PVC pipe. Then he used brute force and dish soap to coerce the wood into the pipe. The extra three feet were then buried in the ground so that even in the event of a hard freeze, the bird house will not be dislodged from the soil. Squirrels are crafty. They will climb nearby trees or structures and leap onto bird feeders. My father planned for this and placed this one far enough from everything else in the yard that it can’t be reached by even the most acrobatic squirrel. They can also climb nearly everything. Everything except, it turns out, PVC pipe. He was hoping this would be the case but was prepared to lubricate the surface of the pipe, periodically, with non-stick cooking spray, had such action been necessary. Thankfully it wasn’t. This one feeder stands in triumphant defiance of the persistence of these fluffy aerialists. But they don’t go hungry. There are other feeders and the squirrels will gladly take the path of least resistance to the food. My father has developed an alternate strategy for preventing this. Initially he fired a warning round from his shotgun. For creatures unaccustomed to gunfire this was apparently quite frightening and, for my father, effective. Eventually, though, they learned that the noise didn’t hurt them and, rather than run off at the sound of the blast, they merely paused their meal. This required a a change of plan. If the sound didn’t fill them with dread and fear of death, then maybe actual death would. My dad decided that the correct course of action was to shoot one and leave its little body as a warning to his peers. This proved only temporarily effective. The squirrels are curious about their fallen comrade, but their investigations are brief, and their grief gives them a powerful hunger. So obviously the answer is to take out a few more. Thin their numbers a bit. One day recently my parents were sitting on their deck, my dad popping off the occasional shot at his backyard target range, or maybe at the occasional squirrel, it’s hard to say, when they were interrupted by the arrival of three men in uniform. They inquired about the gunshots. This is a good time for a bit of history. Back in 1979 when my parents bought the house they still live in, it was one of only 8 on a four mile road. The property is five acres which was the minimum allowed subdivision as stipulated by the zoning set up when the farmer who’d originally owned the land sold off a portion to developers. My parents were on the lot closest to the remaining farm land so they had one neighbor about a hundred yards away on one side, and none at all on the other; just a big farm field. Much to my father’s dismay the farmer has since sold off more land, but this time in much smaller parsels so that field is now home to a small development. My dad doesn’t care for neighbors, and neighbors don’t care for gunfire. He explained to the men that he had a target range along the edge of the woods and was simply doing some practicing. They asked if he’d mind them taking a look around and he agreed. This surprises me a little because I would have, and expected him to have, refused. But he let them go have a look around the yard. When they returned one of them was carrying the carcasses of eight dead squirrels. “Those are pests.”, was my dad’s reply. Technically, given his point of view, he’s right. They are pests. However, the Maryland Department of Natural Resources (or DNR, which I find riotously funny given the nature of their visit) feels differently. You see, there is an allotted squirrel season in Maryland. A time when the good southern folks can legally hunt these majestic creatures for their abundant meat. They asked my father if he has a license to hunt squirrel and he does not. The three of them talked among themselves briefly and then returned to talk to my dad. They’d decided to give a warning, rather than a fine, because he didn’t have a license AND it’s not squirrel season. I know, I fail to understand that logic too. I think what they’re saying is, at least according to the DNR, two wrongs do make a right. As they were leaving one of them turned to my father and asked, “Why don’t you eat ’em?” Why, indeed. I don’t have the heart to tell him that I feed the squirrels so that they come and tap on the sliding door to let me know they’re out of food. Hope he doesn’t try to shoot my little friends.